Unless you’ve been comatose for the past few months, it can’t have escaped your notice that the world and his wife is now obsessed with Kate “Catherine” Middleton. And why wouldn’t you be? Her hair’s so lovely and glossy! (Apparently her secret is the Richard Ward salon + Kerastase Nutritive products). 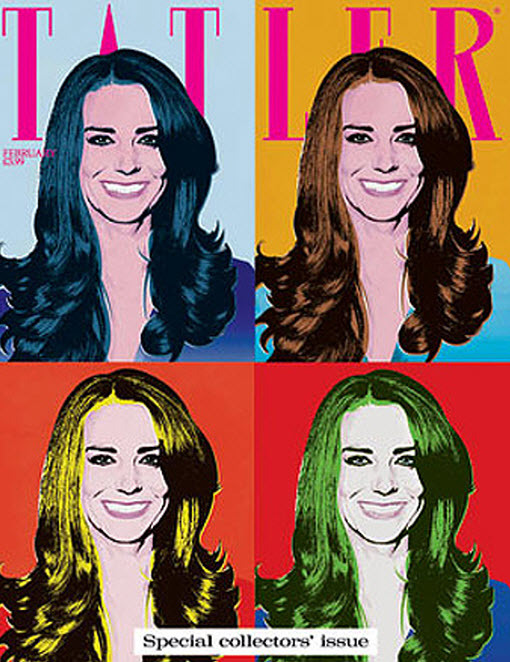 I’m kidding, there’s more to her than “Because I’m worth it” hair, but on the Andy Warhol-inspired cover of February’s Tatler magazine, that’s the feature they choose to focus on. Is it just me, or are you getting a sense of Katy Perry and Cheryl Cole on the top row? I love this representation – in fact, I imagine this design will fly off the shelves as wall art. As much as I don’t like the constant comparisons to Princess Diana (including the fact that Diana was frequently featured on the cover of Tatler) as it must be such a heavy burden for her, there’s something about Kate that is so intriguing. Just like our People’s Princess.